In Mary’s world, there are simple truths. But slowly, Mary’s truths are failing her. She’s learning things she never wanted to know about the Sisterhood and its secrets, and the Guardians and their power. And, when the fence is breached and her world is thrown in to chaos, about the Unconsecrated and their relentlessness. 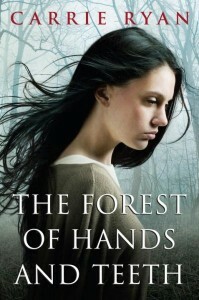 I think that The Forest of Hands and Teeth works out as a fantastic and well written introduction to post-apocalyptic zombie fiction. It was realistic, engaging, horrifying and managed to both keep that realistic and well done horror and be accessible to a young age group. I absolutely loved it. All my life I have been trained by that siren. Before I could walk I knew the siren meant death. It meant somehow the fences had been breached and the Unconsecrated were shuffling among us. It meant grab weapons, move to the platforms and pull up the ladders – even if it necessitated leaving the living behind. Growing up, my mother used to tell me about how in the beginning, when her own great-great-great-grandmother was a child, that siren would wail almost constantly as the village was bombarded with the Unconsecrated. But then the fences has been fortified, the Guardians had formed and time had passed with the Unconsecrated dwindling to the point that I couldn’t remember a time in the past few years when that siren had wailed and it had not been a drill. I know that in my life there have been breaches but I also know that I am very good at blocking out the memories that serve me no purpose. I can fear the Unconsecrated well enough without them. I’m not saying Mary was drawn super unrealistic as a heartless, nerves-of-steel heroine. She played it cool and stopped to think during times when I would have been too frightened to form a coherent thought, during times when she was scared and going on instinct I would have been curled up in a useless ball crying for my mother. She was brave but not stupid brave, you dig? This book continues with all sorts of twists and turns and hints at what really happened in this world to cause the “Return” and who the Sisterhood really is without spelling it out enough for the characters to ever figure things out. I did find that part a little frustrating, I wanted the characters, besides Mary, to be a little more curious about what things were like before the Return, what caused it, and its immediate aftermath and the formation of the fenced off village. But I guess that is the price of both realism and the fact that this is just a YA novel (not to mention only the first in a trilogy!). I loved reading about this heroine and her attempts to unravel the secrets that surround her. I also loved reading about this young woman who was set on her dreams and was willing to make whatever sacrifices needed to be made to achieve them. I also appreciated that while she often dealt with opposition, arguments, self doubt, torturous treatment and impossible circumstances that she never once doubted her belief in a world beyond those gates. This was a fantastic choice for Halloween reading and perfectly matched the eerie mood and cold weather. At one point in the novel she describes a long deluge of rain and a chilly spell and when I went outside I was surprised to find it relatively warm and sunny! I look forward to the second book in this series The Dead Tossed Waves. I recommend this to anyone looking for something light and spooky to read in these last few days before Halloween.